Tourists can soon enjoy a walk along the state’s first ever canopy walk between Castle Rock and Dudhsagar Falls on the Karnataka-Goa border. Work has started on the stretch from Kuveshi to Dudhsagar Falls as part of the first leg of the project. This stretch will pass through eight huge trees. 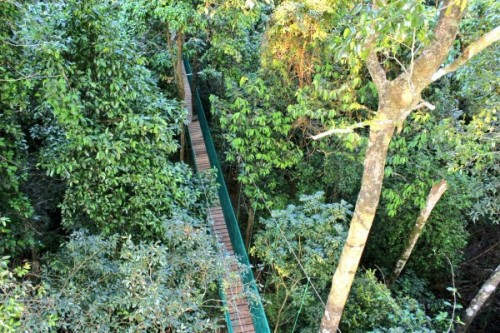 Canopy walkways – also called canopy walks, treetop walks or treetop walkways – provide pedestrian access to the forest canopy. Early walkways consisted of bridges between trees in the canopy of a forest; mostly linked up with platforms inside or around the trees. Such trails are also much sought after by bird lovers and watchers. Being developed by theforest department, in association with the tourism department, the canopy walk between Castle Rock and Dudhsagar in the Kali Tiger Reserve is also part of the proposed Great Canara Trail, the longest trekking trail through the Western Ghats. However, environmentalists believe that the enterprise poses a threat to the eco-sensitive Western Ghats. This is a fantastic idea. I took a walk on a treetop walkway in Costa Rica. It was most enjoyable and the sceanery was unbelievable. There were a lot of people on the walkway and nobody threw any garbage. In fact they were pretty quiet in order not to disturb the birds and other wild life. Very nice even Dudhsagar Fall visitors also saved from tresspasing on Railway Track ( which the only way at present). Secondly Top Tree Canpoy is utilised in many countries without endangering forest life any so I think Nature Lovers fears are not considerable as tourist will be only day time that too for hardly for five hours a day and three months in a year that too full rainy season. Very much true fact as you commented Chandrakant Jadav.. I too have the same very feelings and hat’s off to the joint of forest & tourism department. I think this walk takes you on the top of the falls and not where ppl have visited these many yrs, I mean the Rly Stn..